For additional support related to issues and limitations, please contact Design Support. 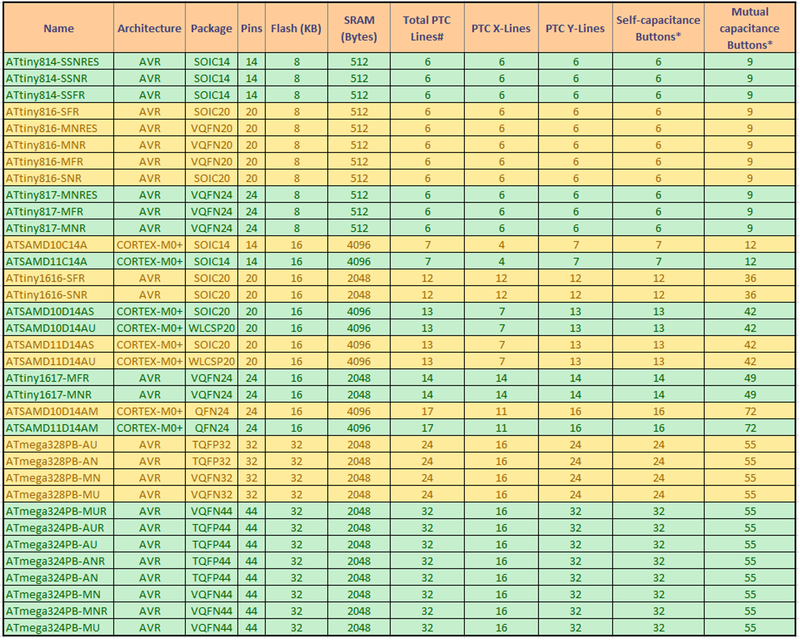 The following QTouch Consolidated Spreadsheet contains information related to the QTouch Library and PTC. Fix related to project reloading to START. Data visualizer utility is updated with Tabbed view(Basic Data, Graph, Advance Data, All Data) in QTouch Data Visualizer display panel. It is required to use latest Data Visualizer from: https://gallery.microchip.com/packages/AtmelDataVisualizerInstaller-Standalone/. ATTiny3217 Xplained Pro Self Capacitance Surface Shield Example Project with QT8. ATSAML10 Xplained Pro Mutual Capacitance Low-power Example Project with QT3. Features tab to provide information on supported feature for the selected device. Gesture parameters expand label, data streamer label update. CSD maximum value based on device. Driven shield conflict with low-power in sensors tab. Low-power example download issue fix. Surface creation popup, sensor count validation. USART clock configuration fix (on pin change). Parallel Acquisition feature added for better SNR for ATtiny1614, ATtiny1616, ATtiny1617, ATtiny3214, ATtiny3216, ATtiny3217, ATSAML10, ATSAML11 devices. Low-power and Lump support added for additional devices - ATSAMD20, ATSAMD21, ATSAMDA1, ATSAMHA1. Self-cap Surface support extended to ATSAMC20, ATSAMC21, ATSAMD51, ATSAME51, ATSAME53, ATSAME54, ATSAMD10, ATSAMD11 devices. Mutual-cap Surface support added to ATtiny814, ATtiny816, ATtiny817, ATtiny1614, ATtiny1616, ATtiny1617, ATtiny3214, ATtiny3216, ATtiny3217, ATSAML10, ATSAML11, ATSAML21, ATSAML22, ATSAMD10, ATSAMD11, ATSAMD20, ATSAMD21, ATSAMDA1, ATSAMHA1, ATSAMD51, ATSAMC20, ATSAMC21, ATSAME51, ATSAME53, ATSAME54 devices. Fixed issue related to Dummy handler triggering randomly when using one touch surface module. QTM_AUTOSCAN_TRIGGER_PERIOD range is corrected to proper values in START. For software-driven low power, project not compiled when low power feature is disabled by setting DEF_TOUCH_LOWPOWER_ENABLE to '0'. Lump and Low-power feature with parallel acquisition will not work correctly. Surface feature with parallel acquisition will not work correctly. SAML10 IAR project does not compile due to SRAM linker script included by default. By changing the linker file to flash, the project will work. Lump and low-power UI design addition. Rubber band selection for creating lump and low-power sensors. Added low-power tab under parameters in QTouch Dashboard to configure low-power parameters. Low-power feature support added with Event Driven and Software Driven approaches. In the event-driven approach, either a button or a lump sensor can be configured as a low-power sensor. In the software-driven approach, multiple sensors (button/slider/wheel/lump) can be configured as low-power. A maximum of 16 lump sensors can be created - if the device has sufficient memory. If Lump is configured as low-power with event driven approach, the low-power detect threshold should be equal to that of the lump sensor. SAME54 and SAMD51: Default clock configuration in Atmel START is changed from 24 MHz to 48 MHz as recommended in the datasheet. SAMD1x: Acquisition module (library) is updated to ensure that bursting happens correctly on the configured Y lines. Surface debug data is sent during burst again to ensure that seamless data is visible in surface GUI. ATTiny81x/ATtiny161x/ATtiny321x: Acquisition module is updated to take care of a bug related to low-power sensor detect threshold (window-comparator threshold). Displaying a notification for Tiny Devices in GUI about the UART for Data Visualizer from Atmel START will only work if the main oscillator fuse is set to 20 MHZ. For Mega devices, the Global interrupt is enabled by default. If ‘ChargeShareDelay Autotune' is selected in GUI, default value of CSD is configured to 20. 'Threshold' column can be edited by the client. T3217 doesn’t compile on IAR™. This is an IAR limitation. Issue in Surface addition options is fixed. QTouch device support was added for SAML10 and SAML11 device families. Post-processing function for frequency hop/frequency hop auto-tune module is called before the post-processing function of keys module in touch.c application file. Compensation capacitance formula in the data visualizer script file was corrected for SAME5x and SAMD51 family of devices. IAR compiler for SAM L10 and SAM L11 family is not supported. Pre-configured clock system support does not work for SAME5x, D51 family touch projects. There are two approaches to create touch projects in SAML11. SAM L11 secure touch example project, where the touch library is placed in secure memory. SAM L11 non-secure touch example project, where the touch library is placed in non-secure memory. For the SAM L11 device, the QTouch Configurator by default generates a touch example project with touch library placed in non-secure memory. To create a touch project with the touch library placed in secure memory, add Trustzone middleware to the project. For more details, refer to the "Generate SAML1X Touch Project" page. The download link below provides the list of devices supported in the QTouch Configurator 5.1 Release. ATtiny817 Xpro with QT7 touch example project is published with two versions. SAM (SAMD20, SAMD21, SAMDA1, SAMHA1 ) devices with 16 KB Flash can be built only in IAR with HIGH optimization for two-finger gesture projects. A) Open the atmel_start_config.atstart file which is part of .atzip Project. B) Search QTOUCH_SAM_D2x in atmel_start_config.atstart file and replace with QTOUCH_SAM_D2x_DA1_HA1. Save changes to the file. C) Load the saved atmel_start_config.atstart file. The link below provides the list of devices supported in the QTouch Configurator 5.0 Release. The Scroller module is updated with a bug fix. The scroller last position was reported wrongly in the last release version. This has been corrected in this patch release. The link below provides the list of devices supported in the QTouch 4.0 Patch release. QTouch Configurator has been updated for the ATtiny3214, ATtiny3216, ATtiny3217, SAML21, SAML22, SAMC20, SAMC21, SAMHA1 set of devices. Mutual-cap signal matrix for pin mapping. Data visualizer dashboard data logging and Compensation Calibration values display . Added device support for the ATtiny3214, ATtiny3216, ATtiny3217, SAML21, SAML22, SAMC20, SAMC21, SAMHA1 set of devices. Added example projects for the SAML21, SAML22, SAMC21J, SAMC21N, ATtiny817 on Xplained Pro kits with either using the QT1, QT7 extension board or On-Board Sensors. Data Visualizer scripts are updated so that Compensation Capacitance Values are shown in picofarads. Global Interrupt is enabled for Tiny and Mega devices in touch_example.c file. touch_example.c and touch_example.h files are kept in the Example folder. When using the slider module, the first reported position from the slider should be ignored after touch. The link below provides the list of devices supported in the QTouch 4.0 release. QTouch Configurator has been updated for the SAMD20/SAMD21/SAMDA1/SAME51/SAME53/SAME54/SAMD51 set of devices. Added device support for the SAMD20/SAMD21/SAMDA1/SAME51/SAME53/SAME54/SAMD51 set of devices. Changed node group data structure for the SAMD10/SAMD11 device family. Added example projects for the SAMD20/SAMD21/SAMDA1/SAME54 Xplained Pro kits using the QT1 extension board. ATSAMD21G17AU, ATSAMD21E16B and ATSAMD21E15C devices are not supported in IAR QTouch Example Projects. This restriction is from the QTouch Configurator GUI not from the firmware side. 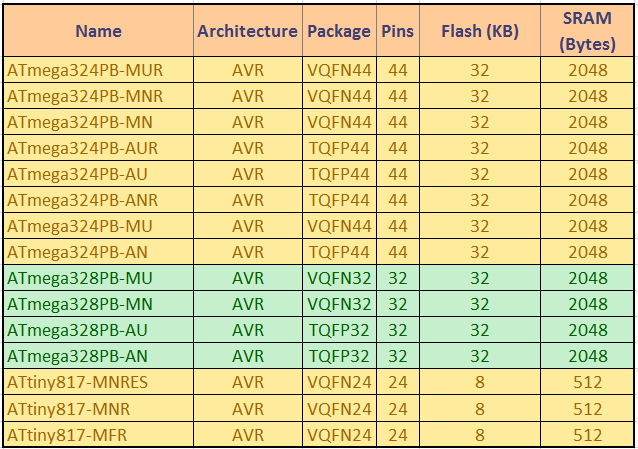 The following table represents a list of new devices supported by the QTouch Configurator in Release 3.0 and also provides information about the range of number of self-capacitance and mutual capacitance buttons supported for various device families. Updated feature to gray out allocated PTC lines in the PIN selection drop down menu. 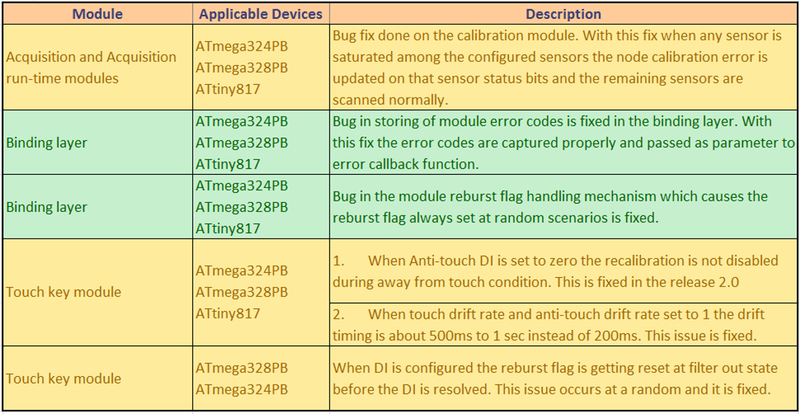 Updated QTouch Configurator guide on the Atmel Start User Guide. Updated Atmel Board Example Projects User Guide. Optimization settings of ATSAMD10 and ATSAMD11 IAR library modules are size-optimized. Fixed bug related to on-board QTouch buttons channel order swap in the Tiny817-XPRO kit example project. Fixed bug on SAM D10/D11 Data streamer module code when acquisition auto tune is enabled. The CSD macro comparison is removed which is not applicable to this device. UART Baud rate changed to 115200 for all SAM User Board and Kit Example Projects. The following table represents a list of devices supported by the QTouch Configurator and the maximum number of self-capacitance and mutual capacitance buttons supported for each device. The maximum number of self-capacitance buttons and mutual capacitance buttons is derived based on QTouch Modular Library RAM requirements. The PTC lines can be multiplexed to be used as either X or Y lines. This is considered when deriving the maximum number of mutual capacitance buttons. Driven shield without dedicated pin support. Frequency Hop without Auto tune support. For ATtiny81x devices, QTouch Configurator project export of only IAR Embedded Workbench is supported. For ATtiny81x devices, when using Slider/Wheel sensors using QTouch Configurator, both Frequency Hop and Data Visualizer features cannot be enabled together in a project - this will result in code memory overflow. Either one of the features should be disabled for the touch example project to fit within device code memory. For ATtiny161x devices, PB4 (Y13/X13) CAN be used as PTC X or Y line pin. However, this is NOT visible through the QTouch Configurator. Following devices are NOT supported in start.atmel.com. Contact Design Support if a QTouch project is required for these devices. The following table represents a list of devices supported by the QTouch Configurator.